POLITICAL TIDBITS: Beguiling Paris, my favorite European city, going up in smoke over rise in Macron's fuel taxes, affecting especially the retirees. Our legislators should outlaw "unli rice" owing to galloping diabetes especially among lower-income Pinoys. Beguiling Paris, my favorite European city, going up in smoke over rise in Macron's fuel taxes, affecting especially the retirees. Our legislators should outlaw "unli rice" owing to galloping diabetes especially among lower-income Pinoys. 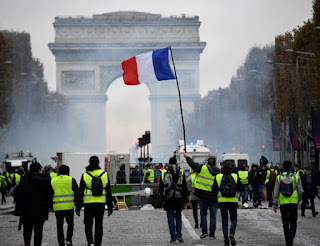 The once romantic and chic Champs Elysee, with the iconic Arc de Triomphe in the background, has become a battleground between yellow-vested demonstrators and police over the fuel tax issue. Paris, unarguably the most beautiful and the most romantic city in all Europe---my favorite for decades---is going up in smoke over an issue that perhaps other peoples would demonstrate against, but not in the same violent and destructive manner as the choleric and highly excitable French would---the rise in fuel taxes that cuts into the income of the already beleaguered middle-class. Last Christmas Day, my longtime friends based in Paris---lawyer Aquilino "Jun" Opena and his wife Lilia, a retired ranking UNESCO official, whom my family and I would visit from time to time over the decades---called to tell me all about what's happening. Lil and Jun felt quite bad that the yellow-vest protesters ("gilet jaunes" in French) would be invading the historic Avenue des Champs Elysees---the most beautiful area in Paris and its No. 1 tourist attraction for international jet-setters and celebrities. 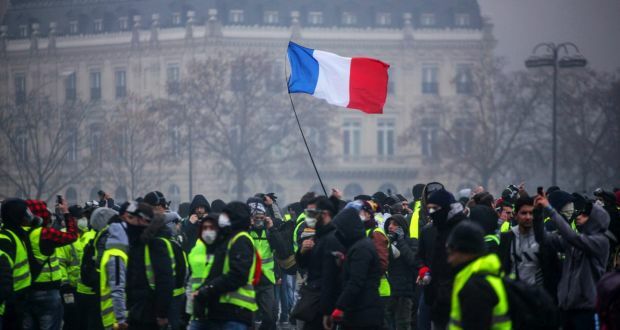 The "gilet jaunes" protest movement began last Nov. 17, 2018, when roadblocks began appearing all across the country, but more concentrated in Paris for maximum effect. 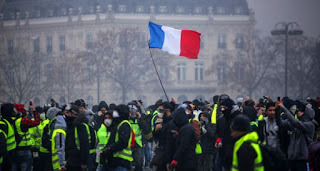 It began as a small protest against the new fuel tax imposed by French President Emmanuel Macron, but over the weeks and months it has morphed into a violent anti-government grassroots movement, with many demonstrators from the middle-class stressing how their livelihood has been eaten up by the fuel tax. Violent clashes with police and vandalism in hitherto quiet and plush neighborhoods turned ugly and international media caught them all---making all lovers of Paris, such as this writer, feel such pain in our hearts. Four people have actually died since the unrest began, even as the resulting violence and vandalism have been widely condemned in France and abroad. President Macron had insisted that tax increases are a necessary pain due to the increased cost of fuel---now at $7.06 per gallon. 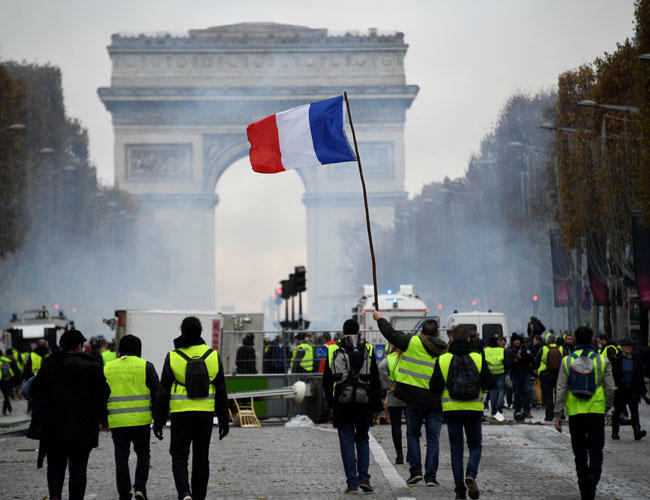 The protests appeared to have swung into full scale after duties were slapped on diesel--- which is widely used by French motorists but now more heavily taxed than any other types of fuel. As the anti-fuel tax movement grew uglier and spread to nearly the entire country, French Prime Minister Edouard Philippe decided to suspend the tax increases for six months. He was quoted in newspapers as grumbling that "anyone would have to be deaf or blind not to hear or see the anger against the government." A direct missile attack on Macron. President Macron had won the presidency with an overwhelming mandate for sweeping economic reforms, but his popularity began to fall sharply in recent months amid accusations---and perception--that he is "a president for the rich." But more than just the backlash against his fuel tax, there's the theory that this much-hated imposition is a necessary obstacle to the French far-right's quest for greater power. French politics are tres complique, with far-right, far-left, center, etc. all clashing. Just how far this grassroots protest movement would end up is hard to foretell. As an observer, I note the difference between the tempers of the French and the Filipino. Our middle-class and the lower strata are indeed also painfully caught in the spiraling of prices of just about everything, due to our near-total dependence on imported oil whose price has skyrocketed. But the Filipino people have remained stoic in suffering the inflation that the rise in fuel costs cause, and we simply tighten already tight belts---unlike the choleric and excitable French who have launched their second revolution last winter and going strong. It's easy to foretell the fate of the top French officials. No, they are not going to lose their heads in the Place de la Concorde in Paris, like what happened in 1789 with Louis XVI and Marie Antoinette there. The youthful Macron, however, is in danger of losing his once ultra-high political standing in the next elections. In fact he's probably finished. One time in traffic I happened to be stopped in front of a "Mang Inasal" restaurant and I could see a waiter carrying a big wooden bowl full of rice--- and hopping from table to table, endlessly scooping rice on the plates of diners. It alarmed me to watch this scene, as I had just read how rice is a major factor in the galloping diabetes among Filipinos. President Duterte has lowered costs of medicines for diabetes, hypertension and high cholesterol under the Tax Reform for Acceleration and Inclusion (TRAIN) Act, R.A. 10963---which is good as it would help especially the lower income groups. But what has to be addressed is the proclamation of Diabetic Center of the Philippines about how diabetes is GALLOPING among Filipinos---doubtless mainly due to excessive consumption of carbohydrates which translates to sugar. Popular thinking associates diabetes only with excessive sugar intake, but nutritionists link it as much with heavy rice intake among Filipinos---one reason so many PInoys are overweight. According to the Diabetic Center, an estimated 5 million Filipinos are diagnosed with diabetes. From the Philippine Statistics Authority come 2016 data that diabetes and hypertensive diseases each accounted for 5-7 % of deaths in the country, or 33,295 and 33,452 cases, respectively. That's a lot of Filipinos dying from diabetes and hypertensive diseases, which should call for more information about food intake that should be lessened. While the administration has cut cost of diabetes and hypertensive medicines starting this Jan. 1, still, those medicines would entail funds from the people that could otherwise go to other necessities in life---if enough medical information were to be disseminated over mass media about proper diet TO PREVENT DIABETES AND ITS AGGRAVATION. Few people realize that carbohydrates, such as in rice, convert to sugar which aggravates THE diabetes ailment. The Department of Health should conduct a wider information campaign about this fact, and yes, there should be an accompanying law prohibiting service of UNLI RICE as a sales propaganda. Yes, stop Mang Inasal's UNLI RICE PROMO---indeed the Pinoy comes out BUSOG, but the diabetes it brings in its path is more VICIOUS than folks think.